So far, Ulysses is the hardest book I’ve read. 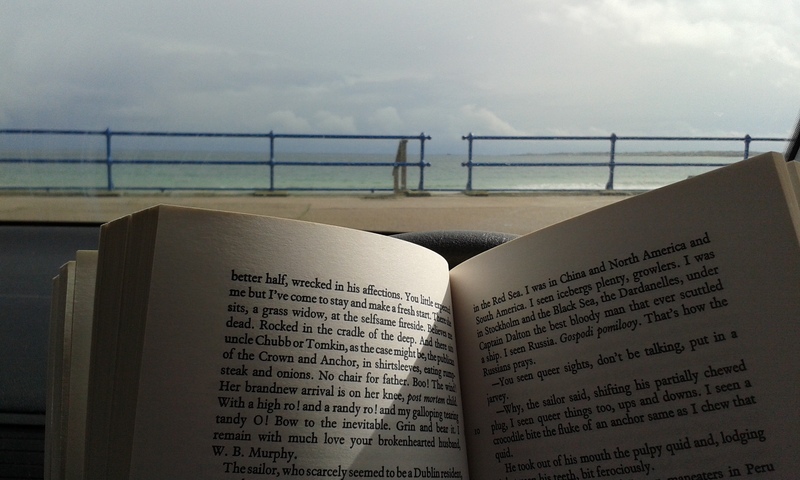 The above picture is me reading on my lunchbreak in the car, parked at Fraserburgh beach as this is not a book I can read at my desk where colleagues might dare to talk to me. It didn’t start out that way, oh no, it lulled me into a false sense of security, having quite an accessible opening. I have a grasp of the Odyssey, I’m a grown-up, I thought I’d be fine. I’m into volume 3, and if it weren’t for the annotations, and the internet, I would be lost. Previously, I found the mile-long sentences of Proust difficult, and found it easier to read certain sections out-loud. With Ulysses, I’m listening to the wonderful audiobook, reading along, and copying it out, and it’s still hard going. Wait a minute, is this bit actually happening? Oh wait, Lord Tennyson has arrived, I guess not. The Sparknotes on this have helped me greatly. Me, and no doubt a load of students twenty years younger than me. Roddy Doyle said James Joyce needed a good editor, and I agree on one point, the lists. Long lists of names, places, etc (Zzzzzzz). It reminds me of the catalogue of ships in the Iliad. Mind numbing, however, not for those ancient Greeks who would have been listening to Homer. They were waiting for their home town to get a shout out. Like listening through all of the football results, all of the names in the credits of a films, just waiting for the one that means something to us. But I don’t think that’s what’s happening in Ulysses. The catalogue of Irish Clergy, saints, the illustrations on an old Irish facecloth of thirty sightseeing sceneries just seem really unnecessary. Although lots of people disagree, and Joycean lists are quite a thing. But you know what, you just go on with yoursel’ there, ‘cos my eye skims over when reading, my ear switches off when hearing. Although, I liked the lists of personal items, such as the contents of a kitchen cupboard, how many gold-rimmed egg cups, because they are indicative of the character’s mode of living. A list of names tells me nothing. However, I do love this book. As hard and long as it is to trawl through, I laughed and learned a lot, having never been more than a foot from a dictionary, but just occasionally, no, James, no. You should have left that bit out, son. While writing this I came across Bad Reviews Of Good Books. I particularly like the Proust stuff. most difficult book I ever attempted to read. Good luck! I’m really impressed at the effort you’re putting in – reading, listening, copying it out plus sparknotes! I got about three quarters through it before abandoning it, but let it all wash over me rather than really grappling with the text. This time round I’ll approach it with more fight, and maybe listen to the audiobook too, but copying it out will be a definite no-no. Cramped up hands I can do without! The audio book with Jim Norton is wonderful, with him singing and putting on the character’s voices, I stand a chance!